Lifehacker found an article from Google's help center that explains how Google Apps users will be able to access services that require a Google account. Google will automatically create regular Google accounts for Google Apps addresses like my.name@mydomain.com, so you can use the same credentials to log in to Google Apps services (Gmail, Calendar, Docs) and Google Accounts services (Google Reader, Blogger, Picasa Web Albums). What happens if a Google Apps user already has a Google account for the same email address? "For example, your Google Apps email address is email@my-domain.com. A while back, you may have signed up for Blogger with this email address, which created a Google Account. Since we've moved your Google Apps account to a Google Account infrastructure to allow access to all Google products, your other Google Account will be renamed to: email+personal@my-domain.com. You should add the +personal extension to your email address if you'd like to sign in to your old account." Google's explanation is confusing and it's not clear why the existing Google accounts won't be migrated. Users will end up with two Google accounts for the same email address and won't be able to merge the accounts. For now, the integration between Google Apps accounts and Google accounts is only available if you are a Trusted Tester, but Google promised that it will be publicly available in the coming months. "We intend to have all Standard, Premier and Education Edition customers moved to the new infrastructure that enables this change in the fall, and customers who would like more control over the timing of this change will be able to make the switch voluntarily during the summer." Unfortunate that they won't be merged, as I have a handful of accounts across different domains each in this situation, but I'm still thankful they're finally making this effort. Well, I just know about that fix-up transitions. But still, there must a main platform to tie up the Google Account and Apps together. So we [common users] will not be confused by the authorization changes. Related to many accounts those linked to Google's OpenID. Thus, it'll be easier to use it. I am curious of know what happens after all this,when my-domain.com(just an example) decides to move away Google Apps. Will the added "+personal" notations will be removed ? Hmmm, I am confused... I have done this (picasa, reader, blogger, voice...) with an apps account for at least a year. Just recently I noticed I can have a separate personal gmail account and be logged in simultaneously but so far I accessed all google services by logging in with my own domain/apps account. The real problem is for people who have been using a normal gmail-base account and want to merge that with a Google Apps one. I know you can migrate the data but what about all sharing connections made. How can they be "merged" if each of them contains completely different and unrelated data in Calendar, Docs, Sites etc.??? I wondered how they want to solve this problem and this solution is actually very clever. Dheeraj: The e-mail address someone+any_string@domain.com is equivalent to e-mail address someone@domain.com. This is a feature of e-mail protocol since its inception, it has nothing to do with Google. So both addresses will resolve into the same mailbox, no matter who and how handles your e-mail. I'm still confused. A bit a go, Google mentioned the addition of services like Blogger and Picasa to apps accounts. Is this the way they are doing so or is this just to solve a merge problem if someone already "added" those services by using a personal Google account? This is pure spin by Google! The issue of Jekyll & Hyde accounts *) as they were dubbed in the Google Docs forum should have been resolved by allowing an easy migration of data from one account to the other. Instead Google makes it harder for users to access their personal accounts by requiring to change their login name. This is the most lowly type of spin to make an annoying bug look like a new feature. *) from which many users suffered that created a Google Accouant with their non-gmail e-mail address and suddenly found they no longer could find Google Docs documents shared to them in their account. In many cases someone created a Google Apps for Teams account for the same e-mail provider (the @EMAILPROVER.EXT part) without these users even knowing this happened. Many asked to get a method of merging their accounts - still this wen on year after year without any proper resolution fromthe involved Google Account, Google Apps and Google Docs teams.! Whoa, calm down commenters, this isn't the end of the world. The whole unified account login system is very much in beta (I'm in the beta test program). It's partly NDA-covered since the system is still in flux, but there are generic aspects that are not really proprietary (some documentation is available for non-beta-testers) that I can explain here. The end goal is to make Apps accounts use the same login tokens and cookies as "regular" Google accounts, thus making it possible to integrate seamlessly with near-all Google products and third party applications. Some of you who regularly use multiple Apps accounts and a regular Google Account have probably already seen a little bit of the early infrastructure in action (such as the Account selector page when first going into Docs or Calendar). Because Apps and "regular" Google accounts already have separate data storage, it's not just a simple merge operation to get data from one account to the other. There's multiple Google products involved, each with their own storage architectures, and so a unified migration system is not really feasible, at least not yet. Note that I didn't say "merge", as it is not yet clear whether users will be able to associate secondary e-mail addresses with converted Apps accounts. As of this writing, the converted Apps accounts only associate with e-mail addresses on the corresponding Apps domain, and you cannot associate with arbitrary addresses in the same domain or other domains. Some products already prevent using the same account for both regular and Apps accounts, e.g. Docs (though you can use the regular account version for your secondary e-mail address(es)) and Calendar. Moving to a unified login token will make this division more explicit for all products, without requiring a bunch of /a/example.com paths. All that said, there are migration paths documented for a large number of Google products. It was a breeze to migrate my Reader subscriptions (existing OPML export/import works fine) and Voice account (there's a customer service request form to move an existing Voice account, including calling credit, to a different Google Account). Some migrations are as yet somewhat clunky, e.g. Blogger access accounts, but smoother migration paths for those products are stated as still in development. The deal with the "+personal" change is to keep an existing "regular" Google Account non-conflicting with a converted Apps account with the same address. This is most notable only to those who use the same e-mail address for Apps and as the *primary* e-mail address for a regular Account. 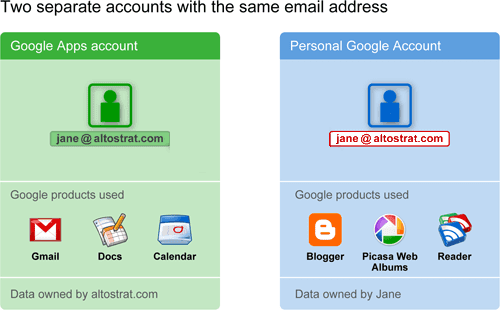 Addresses that do not match Apps accounts are usable on regular Accounts, hence adding "+personal" (acceptable to most e-mail systems, including Gmail) keeps the regular Account distinct. In my case, I added a different alternate address to my regular Account, then set it as primary (instead of the Apps address) to make it easier to distinguish. But I could have just as well let it go the append-"+personal" route. Fear not! There are some other nifty features in development. One in particular that has externally visible documetnation is "multiple login", which allows select Google products (currently Gmail, Reader, and probably others I forget at the moment) to log in to multiple secondary accounts and use them all in different tabs simultaneously. This is intended to replace the "separated cookie" functionality of Apps accounts that, today, use /a/example.com URL suffixes to differentiate logins. This feature works with both regular Google Accounts and converted Apps accounts, once the conversion is done. There are some rough edges here still (Gmail Offline doesn't work with multi-login mode; this should be fixed at some point), but it works just dandy for me. Certainly there will be more official news to come, and there's nothing to worry about now -- the conversion process is completely voluntary in the beta phase. Most of the above information is available to the public if you search around a bit in the Google Help system. When I read about google linking separate accounts (one google-apps, one personal--gmail, etc.) I was wondering about this. Many universities use google-apps, but what happens to a student's account when he graduates? Will he be able to revert to his personal gmail account, even if the two were linked? Google is screwing us over. Now to access picasa, voice, reader, etc I have to login with un+personal@domain.tld instead of un@domain.tld? All because they screwed up from the beginning by not having a unified system? They were the ones who told us to create a separate google account for all google services not offered as part of google apps. Come on google. Do what is right. If we already have a google account with the same addy as the apps account, don't screw with it. use your SSO/OAuth capabilites and don't make life harder for us. What good is a fresh new google account with un@domain.tld going to do me? I already have years of data in my current un@domain.tld google account, now you're changing the name of my account. And while you're taking services and capabilities away from us, like you did with your premature launch of the new docs/spreadsheets, which lag behind Zoho and Microsoft Web Apps so unbelievably far, you might as well take away our free use and start charging ridiculous fees. Maybe then you'd have the money to create a worthy online office suite. I mean you can't spend any of that $25.5 billion in cash you have on your balance sheet to create a the suite, so I you must need more revenue to do it right. Since 2006 you've acquired Writely, docverse and a mirad other companies. Yet google docs is the Word Perfect 5.1 of the available online office suites. WTF? 10:08am: The point is that the accounts are _not_ linked. The university account is only a university account; the personal acocunt is only a personal account. Thanks for the information, Todd. I have the option to merge/migrate/whatever, but got confused by the convoluted Google help page. I gather from your comments that, since I have an @gmail.com account and use my @mydomain.com as the secondary login, the migration will be painless? William: Well, at the least, the gmail.com account can still be used independently (the @example.com secondary address that collides with your Apps account will simply have the +personal appended on the non-Apps account). If you choose to upgrade your Apps account to full Google Account status, you'll still have two independent accounts and will have to choose what data should be in which account. Migrating data is on a per-Google-product basis, and that's why the help pages may currently be a little confusing. I'm hoping that these unknowns straighten out as the Apps account conversion process is improved. Excellent, thanks. By any chance, do you think that this move by Google is indicative of a move toward product integration like Windows Live? Can we have iGoogle for google apps? iGoogle for Google Apps is already available: it's called "start page". Ilyas, Alex: Actually, the Start Page feature of Apps was deprecated a couple years ago and not made available to new Google Apps accounts. Recently, existing Apps domains that still had access to the Start Page feature were offered the ability to switch to the current iGoogle engine, though the feature was not made available to other Apps domains yet. Converted Apps accounts, however, have full access to "standard" iGoogle at both the canonical URL (google.com/ig), as well as the Start Page URL if applicable (partnerpage.google.com/example.com). How easy will moving data from the normal (Apps) account to the '+personal' account be? There have been recurring problems with this in an application like Google Docs. Limitations would e.g. be that it would not be possible to change ownership of files to outside the Google Apps domain. This would mean that personal stuff that got relayed to the App account part would become locked in (I think that was also what another (Anonymous) user was referring to when talking about student university accounts). On the other hand moving data from the Apps account to the '+personal' account may be heavily frowned upon by the Apps' admin; this would mean ownership of documents vital to the organization using the Google Apps domain would become easier (or wouldn't it?). So in essence there is no universal solution for users having personal data locked into the Apps account, nor for Apps admins that would like to make moving organization vital data outside the domain. Or is there...? but buzz is still missing for apps users.. The short answer is, if you want to have personal ownership of an item sent to you, the best choice is to have it sent to a truly personal (or at least personally controlled) account. The issue is that documents that were intended to be personal would go to the Apps 'side' of the account. And that it is not possible - because of admin set restrictions (and issues Google appears to have in general with changing ownership of documents to outside an Apps domain) have these documents as private documents again. Please note that such would be an issue for users who created a Google Account with a non-gmail e-mail address for which in some later state a Google Apps account (often a Google Apps for Teams) was created. These users suddenly found the rules changed that determined where documents shared to them would go. So far the solution Google promised to provide for these users appears only to have resulted - if I understand the forthcoming events - in the requirement that documents that will be shared in the future now can go to either the personal or the Apps part of the account - burdening the users with the requirement to inform those intending to share a document with them personally to use the '+personal' e-mail address. And it still leaves the existing problem - documents that went to the Apps part when the user was not even aware this could happen - unsolved. I'd agree that Higher Ed education institutions choose to allow sharing outside a domain, but a large percentage of Google Apps for Education accounts are K-12, and sharing outside of the domain is not always the best idea. This is a total PITA. +personal is especially a pain on a mobile device. That's a lot of extra characters. I hope there will be an easier method than this to move these together. I have pretty much every Google service all under my GApps email address already. It's not great that they're not merged, but if I suddenly sign-in to a non-GApp like Voice or Reader or Blogger and all of my data is missing, that's gonna be frustrating and maddening. I'd really like this to be optional, or offer some sort of transfer option so that it truly is unified. I got invited to this. Most like picasaweb, reader, custom search and friendconnect are under my google apps account which is awesome. But checkout and checkout for merchants are unavailable.